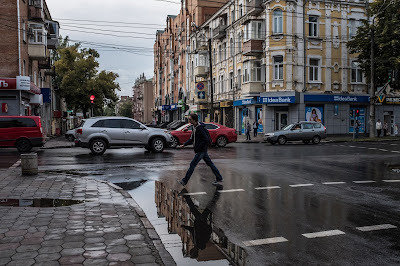 POLTAVA, Ukraine -- After four years of investigation by the German police, the F.B.I. 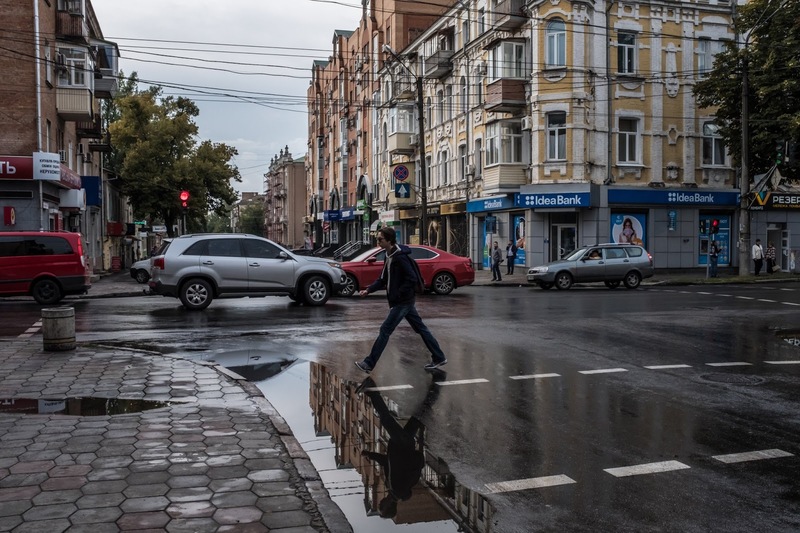 and other crime-fighting agencies around the world, heavily armed security officers stormed an apartment in the central Ukrainian town of Poltava. The apartment building, right, in Poltava, Ukraine, where a man accused of leading a cybercrime ring was arrested. After a brief exchange of gunfire, they captured their prey: the man suspected of leading a cybercrime gang accused of stealing more than $100 million. The arrest of Gennadi Kapkanov, 33, a Russian-born Ukrainian hacker, and the takedown of Avalanche, a vast network of computers he and his confederates were accused of hijacking through malware and turning into a global criminal enterprise, won a rare round of applause for Ukraine from its frequently dispirited Western backers. A judge in a district court in Poltava turned down a prosecution request that he be held in preventive custody for 40 days, and ordered him set free. Mr. Kapkanov has not been seen since. Whether Mr. Kapkanov’s flight was the result of corruption, incompetence or a mix of the two has not been clearly established. The prosecutor general in Kiev, Ukraine’s capital, threatened to fire the local prosecutor but backed off when it became clear that the case had been handled by one of his own deputies. The sagas are unrelated in their substance and timing. Mr. Manafort’s activities in Ukraine predate Ukraine’s 2014 revolution, while the others follow it. But they all flow in part from the same dysfunctions of a weak state gnawed by corruption and thrown off balance by constant Russian pressure, and the open vistas of opportunity for skulduggery that these have offered. “Why is there so much noise around Ukraine? Because Ukraine is the epicenter of the confrontation between the Western democratic world and authoritarian, totalitarian states,” Oleksandr Turchynov, the head of Ukraine’s national security and defense council, said in an interview. He denounced reports of Ukraine providing missiles to North Korea as Russian disinformation aimed at undermining Western support. Mr. Poroshenko, he conceded, is better than his predecessor, the kleptocratic, pro-Russian leader — and former Manafort client — Viktor F. Yanukovych, who fled to Russia in February 2014 after months of street protests in Kiev. “But that is only because he is weaker, and society is much stronger,” Mr. Leschenko said. “Ukraine, with the exception of the Baltic States, is the only post-Soviet republic which is not authoritarian,” said Serhii Plokhii, a Harvard professor and the author of a history of Ukraine. “Its attempts to stay democratic while building a nation are often messy, its oligarchs all powerful and, given the virtual absence of state control over media and oligarchic competition, post-Soviet corruption is out in the open,” Mr. Plokhii said. While still politically influenced, Ukrainian law enforcement is no longer the swamp of incompetence and corruption it once was. It has been able to monitor Mr. Manafort’s former business associates and turn up evidence of Russian hacking in the 2016 United States election, in part owing to American technical support. The Central Intelligence Agency tore out a Russian-provided cellphone surveillance system, and put in American-supplied computers, said Viktoria Horbuz, a former head of a liaison office at the S.B.U. that worked with foreign governments. Ms. Horbuz’s department translated telephone intercepts from the new system and forwarded them to the Americans. “This team would translate and immediately, 24 hours a day, be in full cooperation with our American colleagues,” she said. It is unclear whether any phone intercepts relevant to the election meddling investigation have gone to the American authorities. But a Ukrainian law enforcement official has given journalists partial phone records of former associates of Mr. Manafort. Since March 2014 Ukraine has lost Crimea to Russian annexation and large chunks of its industrial heartland in the east to rebels backed by fighters and weapons from Russia. It has also been used as a testing ground by Moscow for disinformation and hacking techniques later deployed during presidential election campaigns in the United States and France. Ukrainian officials invariably cite Russian meddling to explain why anti-corruption and other steps demanded by the West have often faltered. While Russia is a convenient excuse, it is also a very real menace. Now draped in Ukrainian flags, the monument nonetheless stands as a powerful reminder of Russia’s looming presence in a country that has struggled to create a functioning independent state on the fragile foundations left by more than 70 years of communism and centuries of subjugation by Russian czars. Ihor Havrilenko, a lecturer in Ukrainian history at the Poltava National Technical University, said the release of Mr. Kapkanov, the man accused of being a cybercrime kingpin, was typical of the dysfunction that has plagued Ukraine. “The whole situation is absurd, but nothing in my country really surprises me anymore,” he said, sitting in a park near the Poltava battle monument. It was to Ukraine that Mr. Manafort looked for new business horizons after doing work for despots in Africa and Asia. Setting up shop in Kiev, he became entangled in a murky constellation of Russian and Ukrainian business tycoons and politicians, notably Yanukovych, the president ousted in 2014. Mr. Chornovil, who worked as Yanukovych’s campaign manager in 2004, remembers Mr. Manafort as “arrogant and full of self-confidence,” a showman who liked to organize big, splashy events that required lavish spending. A secret ledger recording payments to Mr. Manafort and others, he said, was part of a crude effort to keep track of all the money sloshing through Yanukovych’s administration. “Everyone was stealing, and the party wanted a record of who got what,” Mr. Chornovil said. The end of Yanukovych’s rule in 2014 upended Mr. Manafort’s business in Kiev and brought in Mr. Poroshenko on a wave of reformist fervor. “There was never a strong state on this land. Medieval feudal mosaics, fragile kingdoms and early-modern Cossack republics had nothing in common with European absolutism or Russian authoritarianism,” said Valerii Pekar, a lecturer at the Kiev-Mohyla Business School, in a recent article. The West, fed up with the dysfunction, has been pushing Mr. Poroshenko with only partial success to tip the balance away from the corruption-tainted oligarchs and Russian proxies who often held sway under Yanukovych. He did establish an independent anti-corruption agency and introduce a mandatory declaration of assets for officials and members of Parliament. But he has so far stalled on setting up a tribunal outside the existing court system to try corruption cases. Larissa Kulishova, the judge in Poltava who let the hacker go, denied that she had erred. Larissa Holnyk, a judge in the same courthouse, said she could not speculate on what prompted her fellow judge to free Mr. Kapkanov but expressed dismay at the decision. Ms. Holnyk has bitter experience of the pressures put on judges. Equipped with a secret camera by anti-corruption investigators, she filmed a representative of Poltava’s mayor offering her a $5,000 bribe to close a case. Posted online, the video produced a public uproar but no action against the mayor or his emissary. “Every time something clearly wrong happens I ask, ‘How can this be happening?’” Ms. Holnyk said.